With over 8 billion to explore, it can be overwhelming when you first start delving into our records. This handy guide will help you get to grips. Findmypast's records are divided into nine broad categories. Here's a summary of what you can expect to find in each and how they'll help your family research. This is one of the categories of records you'll probably use most often. These records, commonly known as BDMs, detail the most important events in your ancestors' lives and are essential for every family historian. Parish records consist of baptisms, marriages and burials and will usually help you take your research back further. 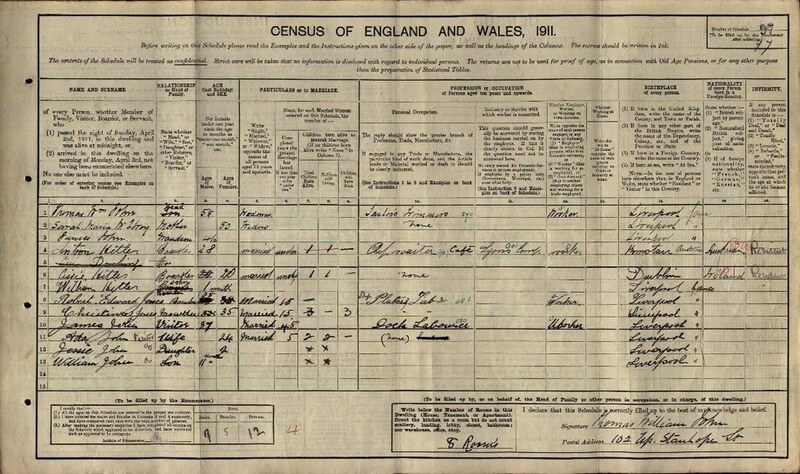 Like BDMs, census records are some of the most used resources in genealogy. As censuses were usually taken every decade, these detailed collections are fantastic for tracking your family over generations. Where censuses don't survive, other land and survey records make useful substitutes and can include electoral rolls, rate books and estate records. Most people will have a connection to the military in their family's past. Findmypast's military collection is one of the most comprehensive online and includes service records, rolls of honour and regimental resources from history's most pivotal wars. 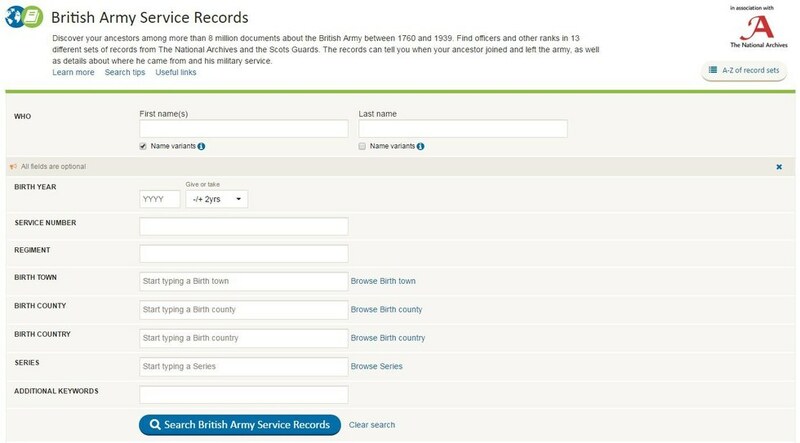 What's more, military records tend to be very detailed - a real boon for genealogists. Our ancestors were travelling the world hundreds of years ago and the records that those movements have left behind help to tell their life stories. 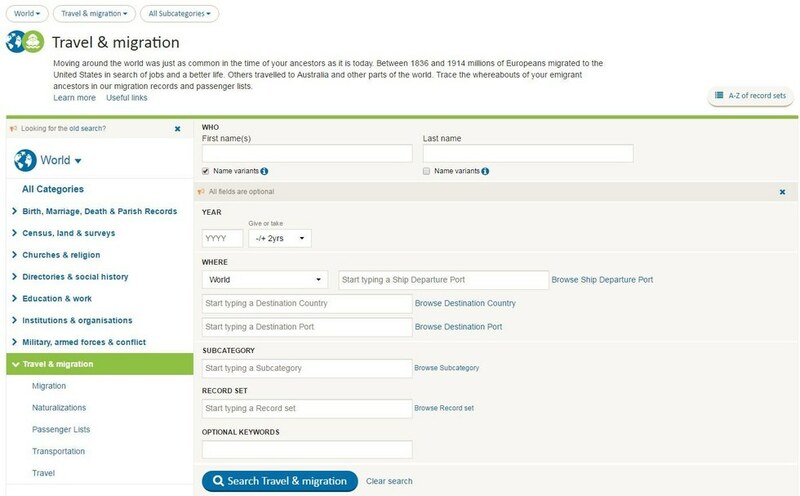 Findmypast has a fascinating array of passenger lists, naturalisation records and other travel resources to help you trace your globetrotting relatives. Our newspapers are some of the most popular resources on the site and it's easy to see why. If you can't find your ancestor in our other records, be sure to try the newspapers where you could find them mentioned in an article or even see a photograph of them. There are hundreds of titles to explore from all over the UK, Ireland, America and beyond and the collection is continually growing. These records are fantastic for family research because they usually include some of the most detailed records available. From crime, prison and punishment records to workhouse registers and government collections, some of your most surprising discoveries await in these resources. You can explore your relative's school life and how they made a living with our exciting collection of work and education records. You'll find all sorts of resources in this category including apprentice registers, trade union memberships and Merchant Navy records. Examining social history records provides a window into the world in which your ancestor lived. Street and trade directories are particularly useful if your relative ran a business. You will also find an eclectic range of almanacs and publications amongst our directories and social history records. One of the smaller collections of records on Findmypast but still useful in it's own right, our churches and religion category includes records of the clergy and church ceremonies. Use the search box on the home page when you know minimal information on the person you're searching for. It will search all the records on the site based on the criteria you enter. When you know what type of record you want to find, you can narrow your search to just that specific category. You can access each of the nine distinct categories via the 'Search' option on the blue menu at the top of your screen. Once you select a category, you'll be taken to a dedicated search page for all the records that lie within that category. Carry out a search from this page and you can use the filters on the left-hand side to further narrow your search into sub categories or jump quickly into another category. 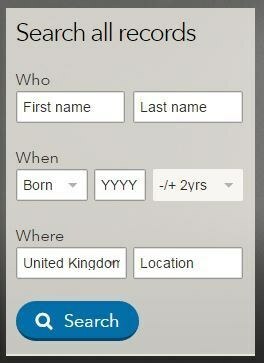 This should be used when you know the exact Findmypast record set you want to search. 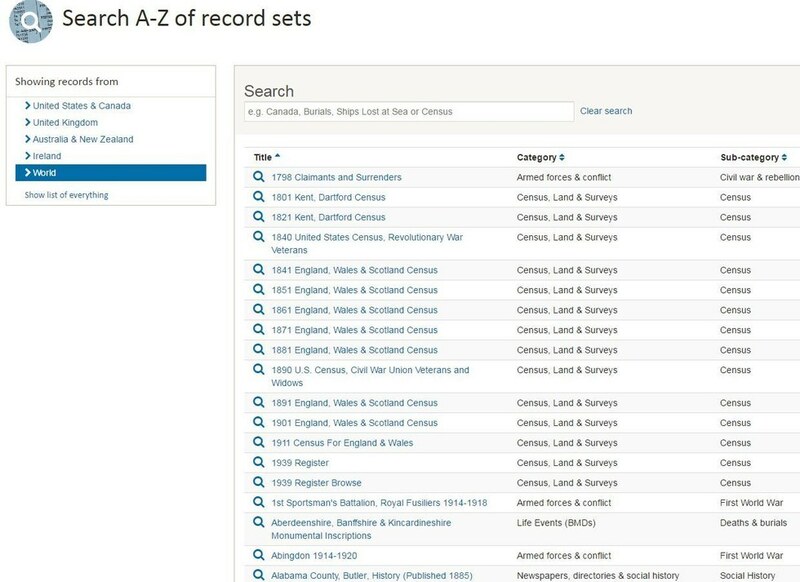 The quickest way of accessing individual record sets is through our A-Z of records. Type the record set name or part of the name into the A-Z search bar and your selection will appear. 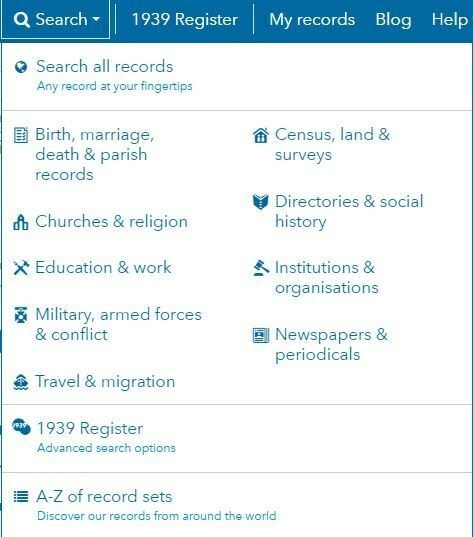 Once you've clicked on the record set you want to search, you'll be taken to it's individual search screen which often includes search fields unique to that record set. This makes it really useful for pinpointing the specific record you're looking for.